e-Learning Courses are the most efficient way to train your staff - our Training Management Suite ensures you can monitor progress and compliance just as efficiently. This combination will save your business time and money, while also allowing all of your staff to complete their compliance training at their own pace and not that of a trainer. As well as the obvious benefits of E-Learning, the biggest benefit for businesses using the Train4Academy System is the ability to be in total control of training at all times. 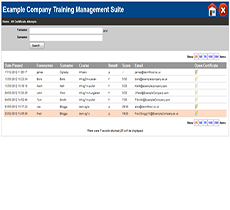 Access to a Training Management Suite is provided FREE OF CHARGE to all customers ordering 10 or more courses and this allows tracking and reporting on all trainees setup on the system. 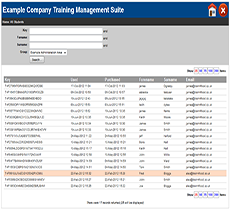 Keep upto date with all of the trainees who are regsitered on the Learning Management System. 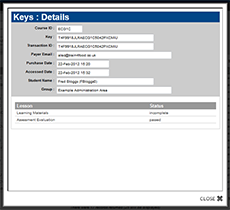 View the trainee enrollments, the date they were registered, their login details along with their progress on the course(s). Have access to of your trainee certificates along with assessment scores. As soon as an assessment is completed the certificate appears - no delays.